President Donald Trump and Vice President Michael Pence made a brief visit on Martin Luther King Jr. Day to the D.C. monument that honors the civil rights icon. President Donald Trump and Vice President Mike Pence made a brief surprise visit Monday to the Martin Luther King, Jr. Memorial in Washington, D.C. The president and vice president arrived at the monument off the National Mall and helped move a wreath covered with red, white and blue flowers closer to the statue of King. Both wearing overcoats amid below-zero wind chills, Trump and Pence stood before the wreath somberly and left about three minutes after they arrived. Neither Trump nor Pence spoke about their visit nor responded to reporters' questions about the government shutdown, which hit 31 days on Monday. Hours before the presidential visit, Rev. Al Sharpton denounced Trump for not holding an official event to commemorate Martin Luther King Jr. Day. "This is an insult to the American people, that the president of the United States does not officially recognize or give any ceremony for Dr. King," Sharpton said at a breakfast held in D.C. in King's honor. 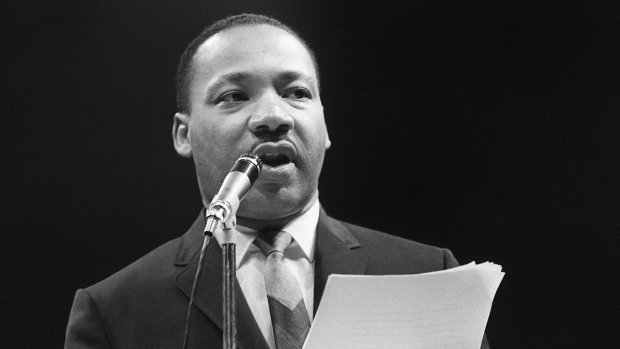 "Dr. King is neither Republican nor Democrat. He is an American icon that made America better." Pence was criticized on Sunday for evoking King's famous "I Have a Dream" speech in defending Trump's efforts to persuade Congress to fund a border wall. In an appearance on CBS' "Face the Nation," Pence said, "One of my favorite quotes from Dr. King was 'Now is the time to make real the promises of democracy.'" "You think of how he changed America," Pence continued. "He inspired us to change through the legislative process, to become a more perfect union. "That's exactly what President Trump is calling on Congress to do — come to the table in the spirit of good faith," Pence said. "We'll secure our border. We'll reopen the government, and we'll move our nation forward, as the president said yesterday, to even a broader discussion about immigration reform in the months ahead."